The Philippines is initiating an investigation on whether to apply safeguard measures on imported cement, raising concerns that Vietnam could lose a major export market. According to the Vietnam Trade Office in the Philippines, the Department of Trade and Industry Philippines (DTI) initiated an investigation whether to apply safeguard measures against cement products imported into the Philippines, pursuant to Section 6 of the Philippines Safeguard Measures Act. The investigation will look at cement with the HS code: 2523.2990 and 2523.9000 and will cover the years 2013-2017. The Filipino investigation authorities said that in 2013-2017, the cement imports increased significantly. Specifically, the total volume of imported cement increased by 70 per cent in 2014, 4,390 per cent in 2015, 549 per cent in 2016, and 72 per cent in 2017. In the first nine months of 2018, Vietnam's cement output reached 23.3 million tonnes, surpassing the 2.3 million tonnes achieved in 2017. 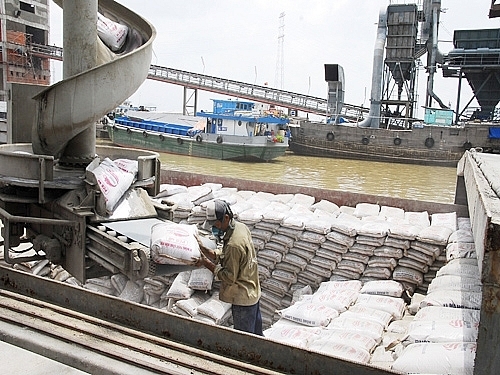 With this momentum, the Vietnam National Cement Association (VNCA) forecasts that the export of the whole year may reach 27-28 million tonnes. According to the DTI, Vietnam was the largest exporter during 2014-2017. DTI supposes that the surging imports caused serious damage to its domestic cement industry, as reflected by a decline in market share, revenue, and profit, as well as the selling price of domestic cement. Vietnam started exporting cement in 2010, with approximately one million tonnes at first. Followed by expanded investment, cement production has increased rapidly, leading to an increase in the export output of tens of millions of tonnes annually. 2014 marked the first year that exports of both cement and clinker exceeded 20 million tonnes, and while in the next two years exports declined, they remained at 16 and 15 million tonnes, and jumped up to 21 million tonnes in 2017. According to data from the Vietnam National Cement Association (VNCA), by the last day of 2017, the total capacity of the cement industry reached 100 million tonnes per year, while only about 60 per cent was consumed by the domestic market. In fact, the production capacity of cement factories can reach 113 million tonnes of cement with 70 per cent of clinker and 30 per cent of additives (the current rate that factories are using now). Cement is clearly in oversupply in Vietnam and it largely depends on exports, with the Philippines being one of the key export markets. According to the latest data from the General Department of Vietnam Customs, in the first eight months of 2018, Vietnam exported nearly 4.2 million tonnes of cement, earning about $190.4 million. In 2016, Vietnam exported 3.8 million tonnes of cement and clinker to the Philippines, worth $184.8 million, accounting for 33 per cent of the total cement exports. The exports to the Philippines in 2017 reached over four million tonnes, which was approximately $200 million. Nguyen Quang Cung, chairman of the VNCA, said that after receiving information from the Ministry of Industry and Trade, the association informed members about the initiation of investigations in the Philippines so that they can prepare. "Certainly, exporting cement to the Philippines in the future will be more difficult, as manufacturers in the country want to protect the domestic industry, and it is likely that the Vietnamese cement industry will lose a big export market," Cung said. The VNCA representative added that the export price of cement is higher in the Philippines than in other market like Bangladesh or China. Therefore, reduced exports to the Philippines would be regrettable. For example, in the first seven months of 2018, Vietnam’s exports of cement and clinker to Bangladesh accounted for the largest volume, with 4.74 million tonnes, but earned only $152.7 million. The second market is China with 52 million tonnes ($158.3 million), while exports to the Philippines were only about 3.5 million tonnes, but brought in $159.7 million. As an early Vietnamese cement exporter to the Philippines, Hoang Manh Truong, chairman of The Vissai Cement Group, said that the safeguard measures against Vietnamese cement products is saddening, but the company also has diversified plans and will focus on exploiting emerging markets if exports to the Philippines slow down.